We’ve pushed the 1.13 update to PC (Steam & GOG), PS4 version will be up shortly. 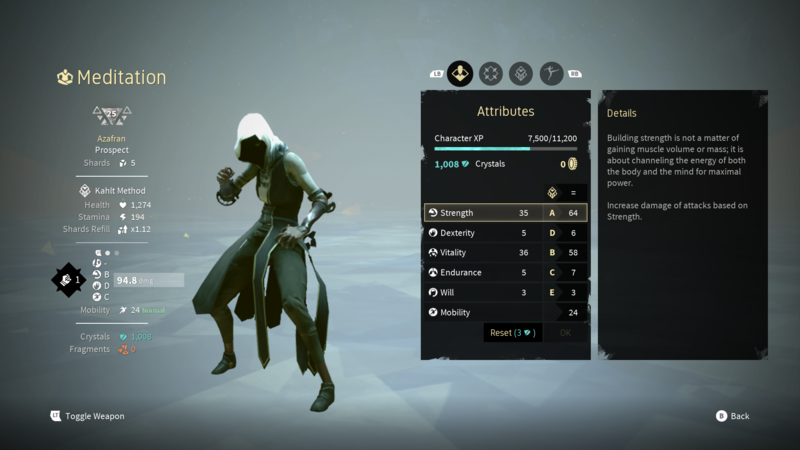 There are a lot of changes in terms of gameplay in this version of Absolver, below you will find detailed explanations on these updates. The patch notes can be found at the bottom of the post. 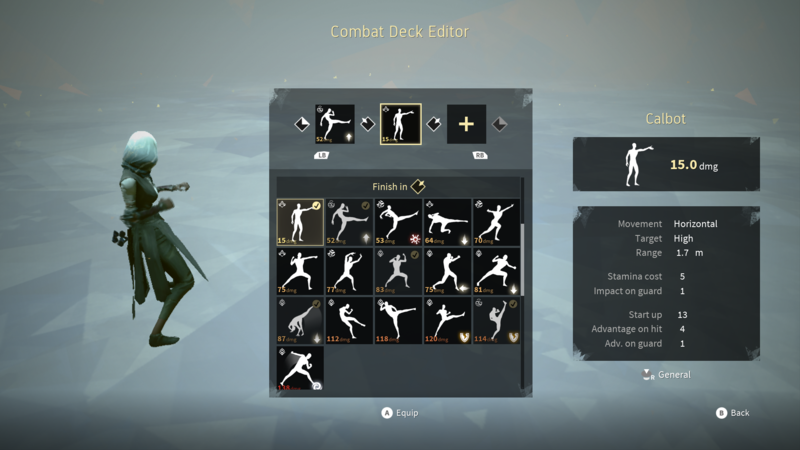 First of all we wanted to shed some light on how some systems work in Absolver. In the attributes panel, you can now see how your Combat Style bonuses impact your attribute points. It will make it easier for you to manage your attribute points and see where the soft caps start. We also added a detailed version of each attack’s parameters and you can access in the attacks list panel. It features values such as range, impact on guard, stamina cost, advantage frames on hit (in gold link), etc. Now in terms of gameplay changes, we focused on allowing more viable options to the builds you create. Firstly, we reduced the Combat Style attribute bonuses. They were too high and did not allow you to make really meaningful choices. Now, having 2 attributes at max value will have a strong impact on the other ones. We also increased the number of attacks having damage scaling to have strength, dexterity, and mobility become more viable attributes. Secondly, we balanced most of the attacks. Keep in mind that because attacks can be used in different contexts (before or after any attack, with different combat styles, etc. ), we need to take into account the whole roster of attacks to balance them properly. So when we work on balancing, it can impact all the attacks. Other important point: we have fixed a nasty bug that sped up 17 attacks (including Back Tripped Kick, Double Fist Stretch and Grab Punch) and slowed down 17 others (like Spinning Wide Hook and Collar Chop) under specific conditions linked to absorb. The main change is that we now define the gold link release value specifically for all attacks (previously it was set depending on the attack damage), and as such, we nerfed the gold link release value of fast avoid attacks and most of the fast sword attacks. Fast avoid attacks, like Jumped Light Kick or Back Tripped Kick, were overused compared to normal fast attacks. By impacting their release value we hope to fix this. For info, their damage and damage scaling ability were already lower than normal attacks. We applied the same kind of gold link adjustment to fast sword attacks to slowdown the pacing of the sword a bit and allow more predictability. As a consequence, damage computation does not take the normal release in account anymore, but the gold link one. This change affects all the attacks. For instance, Stagger Style attacks such as Hadrunken, Handstand Kick, and Donkey Slap have lost 10-15% of their damage, and attacks such as Cross Punch, Pulmonary Palm, Bending Palm have gained 10% of damage. Thirdly, we made a move towards creating more combat variety by making the weapons more reliable. We increased the durability & disarm gauge of all weapons as well as the disarm regen overtime when you are holding the weapon. This means that weapons will break less, and it will be harder to disarm opponents. On top of that, folding back your weapon now gives you back an amount of shards depending on the shard cost of the weapon and its current durability ratio. We think that these changes will create more strategy around sheathing and getting back a lost weapon. Lastly, we worked on balancing Combat Styles. The datas we have show that Kahlt users have the biggest win ratio (59%), followed by Forsaken (51%), Windfall (47%), and then Stagger (42%). We decided to try out some changes until we extract and analyze more detailed datas (skill rating, combat deck, etc.). We added a bonus effect lasting 5s when a Stagger character avoids an attack with any avoiding attack (including its own special attacks). This bonus effect gives “stamina regen x1.2”, “actions stamina cost x0.8”, and is stackable (similarly to the bonus effect given by the Kahlt absorb). We also increased the “stun on hit” of the stagger special attacks, and a little bit of their range. We increased the stamina gain on avoid successfull (35 -> 40), and the slowdown when avoided. We added freeze frames (6 frames) on the attacker when “absorbed”. After the freeze frames, the attacker can still perform a gold link attack. It’s a slight buff against fast light attacks but will have no real impact on medium/strong attacks. In return, these freeze frames force the Kahlt player to perform his ability twice against double-hit attacks. Besides that, we increased the impact of every attacks on guard to lessen “turtle-strategy” behaviours. Thank you for your support, and please let us know what you think of these changes! The game definitely needed a shakeup. I'm a little iffy on the Kahlt change, it was already becoming more dominant over parry, so it having a chance to counter it's one counter which was fast chains is going to be something that'll have to be adjusted quickly if it gets out of hand. And I am amazed the speed up bug was found and fixed. I could not figure out what caused it, but I knew it existed. Can't wait to jump in and see how these changes have affected the game. Can't believe Stagger has the lowest win ratio! Let's remedy that Team Stagger! See you out there. Now just slow at 118 but its fine cause im still a tank compared to others who have faster, weaker strikes. I have yet to get a good feel for all the changes but simply hearing the difference in my hits made my face drop lol i really love the new changes to windfall ALOT, windfall really needed a boost. Feel the same about goldlink! Combo looks ugly now. I feel like once you get used to it no big deal. Now instead of focusing on one long combo focus on each position, for example alot of people use that spinning back hand as a starter in the top left position as a means to ensure the second move can at least be thrown out before getting tagged and combo broken. Look at each position as a tactical 3 hit combo, land those and fight accordingly and its not so bad. When you do get the gold link down again however have fun cause its really not as different as you think, thats what practice is for fold well my friends.